Thanks for joining us on a day of talks and continuing fallout from last Thursday's general election. We're closing our live page for the day. But stay across BBC News NI online for any developments in Stormont or London - there's plenty more to come! So, where are we after a busy day at the political coalface? 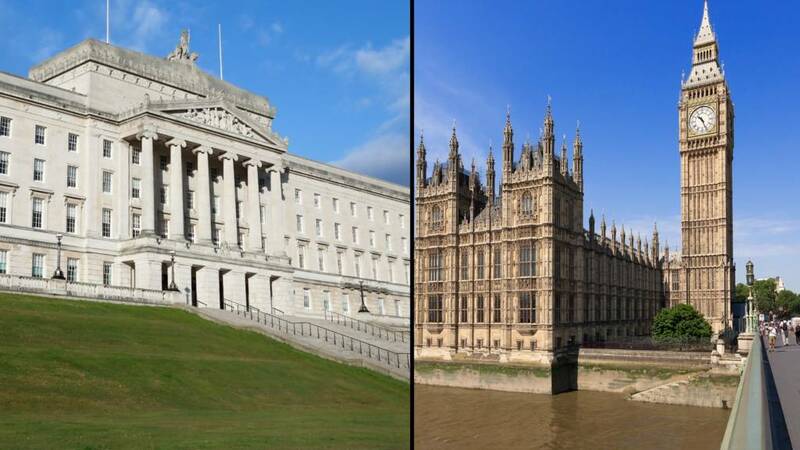 Talks at Stormont have restarted, with all the parties having held initial discussions with each other as well as NI Secretary James Brokenshire and Irish Foreign Minister Charlie Flanagan. Meanwhile, Arlene Foster says she'll fly to London tonight to meet with Theresa May along with the DUP's parliamentary party. BBC political editor Laura Kuenssberg earlier tweeted that a DUP-Tory deal could come tomorrow afternoon and it appears that talks in Northern Ireland may take a back seat until that is confirmed. James Brokenshire says the British government is "very clear" on its responsibilities under the Good Friday Agreement and that it will "act fairly to the benefit to all communities". In a quick statement made to the media at Stormont, the secretary of state for Northern Ireland said the discussions between the DUP and Conservatives were "entirely separate from our intent and desire to see devolution restored here". With that, the NI secretary said he was returning to the talks and headed off without taking questions. Tune in to BBC Newsline tonight for a round-up on today's political action. Grab a seat while you can lads, the political developments look set to run and run. DUP deputy leader Nigel Dodds has challenged Sinn Féin to rule out taking a role in the Irish government after the party criticised the DUP for potentially entering into an agreement with the Conservative Party. He says the Irish people would be "very, very interested" to know whether Sinn Féin would rule themselves out of government "on the basis that it's a breach of the Good Friday Agreement". "Because if that's what they say about us, it applies to them equally," he adds. Political hacks at Stormont tried their best to get some details out of the DUP leaders about their negotiating position with the Conservative Party but, alas, they're keeping things close to their chests. "We're not going to negotiate over the airwaves," says Arlene Foster. "We're going into these talks with the national interest at heart, the union as I said before is our guiding star - we believe in the union, we believe in national, stable government and that is at the forefront of our mind." DUP leader Arlene Foster and deputy leader Nigel Dodds have been speaking to the media at Stormont, with Mrs Foster saying that a deal between her party and the Conservatives could be boost for Northern Ireland. "Parliamentarians would like to play as full a role as they possibly can in our national parliament, just as some in Sinn Féin would like to play a role in the Irish parliament," she says. "I think this is a tremendous opportunity not just for this party but for Northern Ireland in terms of the nation, and we're looking forward to playing our part in that." Does Northern Ireland get more public cash than rest of UK? Parts of the DUP-Conservative discussions are expected to involve funding for Northern Ireland. How much government money already goes there? Our colleagues over at Reality Check have been crunching the numbers. The shadow Brexit secretary has said the delay to the Queen's Speech "shows the level of disruption and chaos that the government is in". Sir Keir Starmer told Martha Kearney, "They've got fundamental problems with any arrangement they come to with the DUP, and fundamental problems with Brexit". On Brexit negotiations he said the government was "sweeping options off the table before they even started" and that there needs to be "a different tone and approach". DUP leader Arlene Foster says her party wants devolution up and running as soon as possible after a "constructive" meeting with Sinn Féin. Sinn Féin's Conor Murphy says it "would be kind to describe [James] Brokenshire as delusional" after the secretary of state said he would continue to chair talks aimed at restoring a power-sharing executive in Northern Ireland. Mr Murphy said: "Of course he's conflicted, he always has been conflicted, the British government are conflicted because they are players in this process, they have a very direct interest, in particular in the legacy issues, and they have never been neutral." SDLP leader Colum Eastwood is the latest figure speaking to the media at Stormont - and he says James Brokenshire cannot go on as the chair of power-sharing talks. The decision by the government to enter into a confidence and supply arrangement with the Democratic Unionist Party could have consequences for attempts to restart power-sharing in Northern Ireland. Sinn Fein has said the British government's attempts to have a pact with the DUP meant it was no longer able to act as neutral broker. John Bruton served as Taoiseach of Ireland from 1994 to 1997 and helped instigate the peace process. He told the World at One he hoped the planned deal would make Sinn Fein keener on "getting the [devolved] Institutions up and running so that issues will be sorted by Belfast, rather than by a DUP-Conservative coalition". Former Conservative Party chairman Grant Shapps has said he doesn’t want to be in government or in coalition with the DUP, but he is happy to engage in a confidence-and-supply arrangement with the party over economic matters. He said he was "uncomfortable with many of their social views" and that "there are things [he] could quite literally never, ever support". On the position of NI Secretary James Brokenshire as chair of the Stormont talks as DUP-Conservative negotiations continue, Charlie Flanagan said he expected him to "adopt a stance of rigorous impartiality". He added that he expected the same from Mr Brokenshire as "other parties in the negotiations will find from me as a representative of the Irish government".